For the last two years we have had several sever storms that have caused power outages for about a week. Our house is completely run by electricity, so we don't even have flushing toilets when the power goes out. No water, lights, or stove... but we have been able to make due. There is a stream across the street from us where we can get water. We make lots of candles from our bee's wax that we harvest, and we own two camping stoves. The only thing that makes us really uncomfortable during a power outage is when it gets cold. We have a fireplace, but that give off limited heat, so after Hurricane Sandy we really thought about how we would prepare for the next storm. Yes, with global warming happening I think it is fair to say that we will continue to experience extreme weather. My husband and I both don't like generators. They are noisy, dangerous, and dependent on gasoline which there was a shortage of during this last storm. Instead we decided to get a wood burning stove. A stove cuts our heating costs, and allow us to use, the renewable and very abundant fuel: wood... that is now, thanks to Hurricane Sandy, scattered all over our property. We decided to get an insert stove for our fireplace and we didn't need a very large stove to heat our small house. We will be getting a Renewable Energy Tax Credit of $300 from the government for the stove because it is in investment in renewable fuels. The wood so far isn't costing us anything. My husband has been getting into great shape chopping it... saving money on a gym membership for him. It is amazing how efficient these new stoves are... you barely see any smoke come out of the chimney. 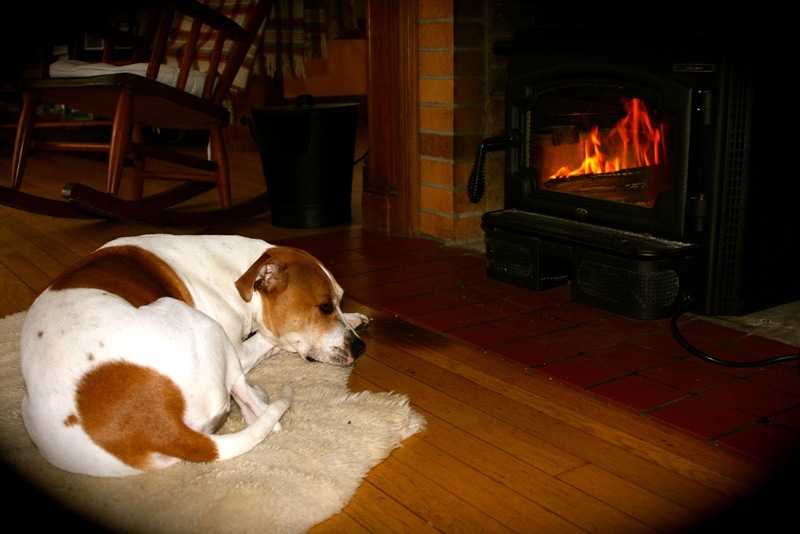 By adjusting the air flow, a single log can burn for a few hours. When we put the blower on high our entire house can be heated...even on a day that is in the 20's. Besides the fact that our furnace, which we keep set on 60's degrees hardly ever goes on... I can't tell you how cozy the heat from a wood burning stove is... so dry and the smell of the wood... it is just wonderful. If you live in a cold area with abundant wood that is not densely populated, I suggest stopping into a wood burning stove store and seeing if one may work for your home. Depending on the physical make up of the area you live in there are environmental factors to consider. I love having any place to build a fire. I'm not sure I've felt the difference of having a woodburning stove in heating the home, as opposed to just a fireplace though. Our fireplace would only give off heat right in front of it and we would burn a ton of wood to keep it lit. The stove heats the entire house and I just came back from being out the house for 3 hours and the stove didn't go out and is still blowing (which means the heat being generated is enough to trigger the blower) It is amazingly efficient. Interesting. I don't think our woodstove has a blower. We've only use this one once though (a few days ago). I'll have to investigate it further. I would definitely love if it heated more of the house. We have electric wall heaters in every room, and 2 large gas furnaces in the hallways. 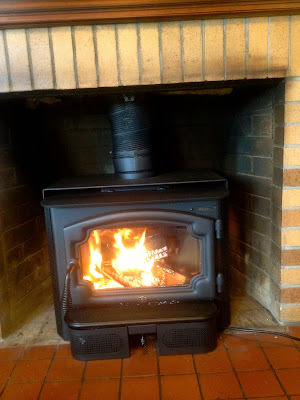 Dh and I talk about getting a woodstove sometimes. A neighbor uses a pellet stove for his house, though his is only one level. I miss the smell of burning wood! Thanks for linking up at Motivation Monday. What kind of insert is this? Where did you get it from? Did you guys end up running a liner all the way up the chimney too? It is a Lopi stove and we got it in CT. Yes, we did have to run a liner all the way up the chimney.